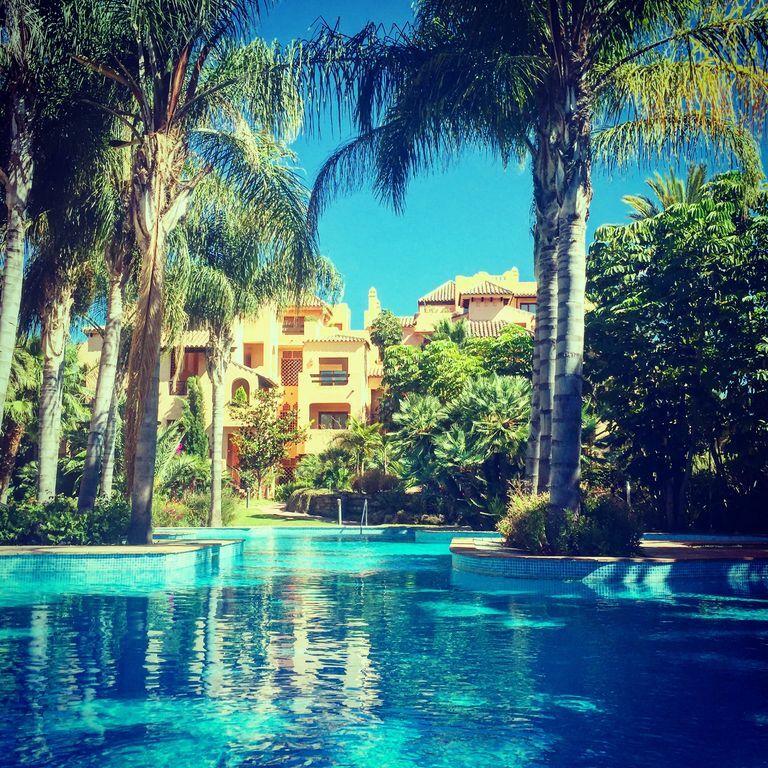 Situated within luxurious El Campanario resort and set in stunning Andelucian gardens with magnificent water features and swimming pools. Gated development. Shops/restaurants within walking distance. Large 42 sq metre terrace with lounge/dining furniture, direct access to the garden. Nearest golf course less than 2km and nearest beach same distance. Approx 8 golf courses within 10 km's. Apartment fitted to the highest standards and fully equipped to ensure your stay is totally relaxing, marble flooring throughout. Lounge/dining room. Spacious area with sofa and separate sofa bed converting into standard double bed with luxury mattress. 40" flatscreen tv, British programmes accessible through Apple TV. Extendable dining table to seat 6. * Hot & cold air conditioning adjustable for each room. * Master bedroom with kingsize bed, fully fitted wardrobes, luxury en-suite bathroom (underfloor heating) and terrace access. * Guest bedroom with twin beds, fully fitted wardrobes, mountain views. * Shower room with walk in shower and underfloor heating. Meet and greet service upon arrival. Please note within normal working hours there is no charge for this, however, for late evening arrivals a supplement will be charged. Several golf courses surrounding apartment. Nearest communal pool 20 metres walk through landscaped gardens, 2nd larger pool at front of development. Both pools fenced and gated to conform with Spanish safety law. Air-conditioning is hot and cold. Small children will need supervision due to proximity of water features. High speed wireless internet available for additional £20. We stayed for a week in this apartment at the end of August, 2 adults and 3 young children. The apartment was amazingly well equipped, and immaculate. It was very well located for the local supermarkets, large and small, and the nearby restaurants were very good. I would say that a car is almost essential, and driving in Spain with three small kids in a hire car is a bit of a hair raising experience!! However not a reflection on the apartment itself of course. The swimming pool was nestled in the most amazing landscaped gardens and the ducks kept my 2 and a half year entertained no end. All in all we had a fabulous time and are looking forward to returning soon. Thanks for letting others enjoy your lovely apartment. Thank you Elaine for your lovely review. Our aim is to give a home from home experience. We’re really pleased you and your family enjoyed our apartment. To start with the owners provided us with plenty of information about how to find the apartment, how to use all the equipment and the local amenities and wifi. This was really helpful. When we arrived we were met by Jim, who was very helpful and showed us everything in the apartment, despite our late arrival. The apartment itself was gorgeous. Not just beautifully decorated and well presented inside and out, but it also included extra's to make the stay more enjoyable. Our children really appreciated the use of the inflatables for the pool and the board games. There was a selection of books. Plenty of towels and bedding and the kitchen was well kitted out with everything you'd need. Lots of comfy chairs on the patio and loungers if you wanted them. The complex itself wasn't full which meant some mornings we had exclusive use of the swimming pool - wonderful!! The kids loved finding the baby frogs in the pool and we loved listening to them in the evening on the patio!! A car is required to get around but the location is central to many places; we visited Gibraltar, Puerto Banus, San Pedro beach, Estepona and the lovely mountain village of Benahavis. All recommended by the owners. Overall this was a gorgeous, family friendly apartment which we would have no problem visiting again. Many thanks to the owners for our fabulous stay!!! Thank you Kim for your lovely comments, you're welcome back anytime. Such a beautiful 'home away from home' appartment. Anything that you would need is already in there. Thank you Sophie, we really appreciate your lovely review. Look forward to welcoming you back soon. this is the second time my family and i have stayed at this apartment it is a beautiful place well kept and very spacious my children love the swimming pools. The gardens outside the apartment make you feel like your on a tropical island. We are already looking to book again for next year. Thank you for such a fantastic and memorable holiday. Thank you so much for this review, much appreciated. Super Luxury Apartment in a fabulous location!!!! The apartment was perfect, real luxury with all the things you need. We especially appreciated the heated floors in the bathroom and the Apple TV!!. The apartment is clean and spacious with a lovely terrace out to the lawn and seconds to the pool. The surroundings are beautiful with tropical gardens, waterfalls and two lovely pools. There is loads to do in the surrounding area - couple of mins drive to the beach, the stunning hilltop village of Benahavis which as a varied selection of restaurants. We took a drive to the historic town of Rhonda and the beautiful village of Zahara and the amazing lake. Thank you, your review is really appreciated. Our main emphasis is giving a 'home from home' experience in a wonderfully sunny part of the world! We welcome you back anytime. Located in the quiet El Paraiso area of San Pedro with easy access to Puerto Banus and Marbella there is a vast range of beaches, restaurants and bars to choose from. Numerous golf courses surround the resort including the famous Gary Player El Paraiso course and the stunning Los Flamingoes course. The mountain village of Benahavis with it's world famous restaurants is only 10 minutes drive away. The resort is the same distance from Gibraltar as Malaga, offering an alternative arrival/departure point. Apartment 10 min drive from J172 (San Pedro) of E15/A7 motorway. Check in after 4 pm Check out before 11:00am High Speed Wireless Internet available at additional £20.